Craig Tracy is dedicated to creating surreal moments in time. 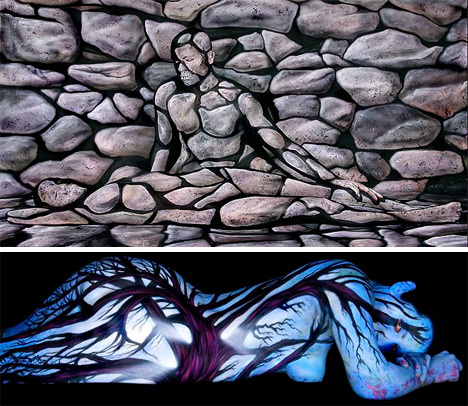 Without the use of digital manipulation or photographic tricks, he creates dazzling body painting compositions that have elevated this particular type of artistic expression into the realm of fine art. 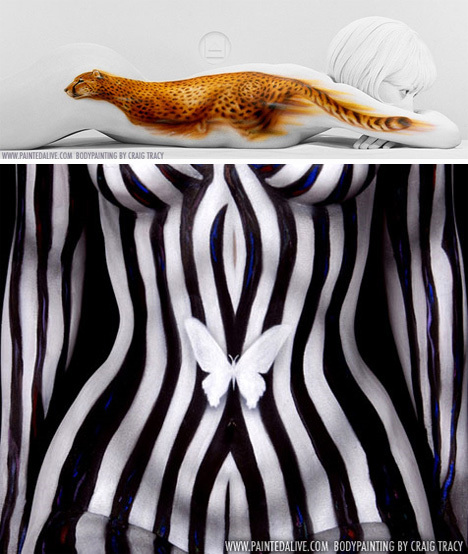 He recently opened a gallery in New Orleans: the first gallery in the world dedicated to fine art body painting images. Although he’s been an artist his whole life, it took Craig Tracy a number of years to truly find his passion. His first professional art job was airbrushing t-shirts in a shopping mall. This experience gave him the foundation that would later lead him to discover that he could – and should – paint on unusual surfaces. After college, Tracy went on to become an illustrator. Like many artists, he found the work dreary and depressing. With no artistic freedom and no way to imbue the projects with his own style, he felt trapped. After retiring from illustration and declaring his freedom from stuffy commercial work, he discovered that body painting was the only type of art that truly made sense for him. Starting out painting faces, he progressed to painting bodies and eventually began showing and selling prints of his body paintings in his own gallery. Since then, Craig Tracy’s work has developed into a full-time passion. His body paintings show the strength and aching fragility of human bodies, juxtaposed perfectly with the fluidity and transience of the pigments in which they are covered. In some paintings, the model blends with the background, creating a stunning illusion. In others, the painted model is the focus of the piece. 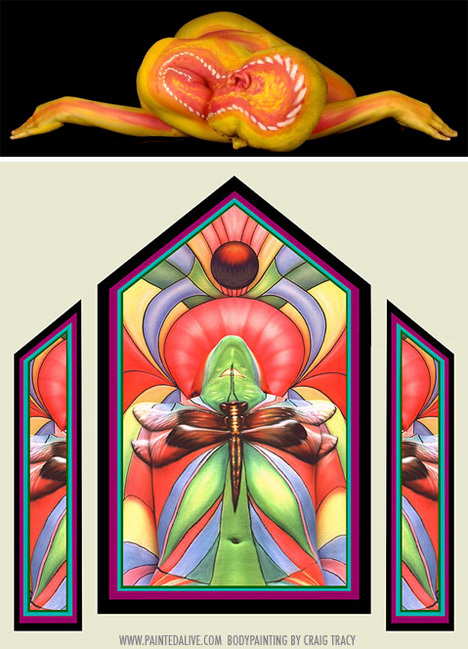 The above piece (bottom right), named “Butterfly” as a reference to the subtle butterfly disguised as a nose, features a woman as the leopard’s nose bridge. Her bottom forms the big cat’s top lips. The artist took 24 hours to paint the model and backdrop, pausing only for a one-hour nap. Unlike Emma Hack, an artist who uses body paint to melt models into the background of her paintings, Tracy seems to celebrate the human form present in his work. Rather than hiding the model, he allows the curves and shadows of her body to interact with the entire piece, adding a depth, texture and powerful mystery to the paintings. In doing this, he travels to a rather artistically dangerous zone. Just how much should the model’s form be allowed to influence the shape and direction of each piece? At what point does the body cross the line between canvas and subject? Each of Tracy’s paintings seem to play with these limits, exploring the human form as both the focus of the painting and an incidental part of it. Between those two extremes are many shades of grey, each of which is explored lovingly by the brush of the artist. The result of his playful and experimental approach to art and his obvious passion for what he does have made Craig Tracy one of the most respected contemporary body painting artists in the world. If you’d like to see more of the artist’s work, Craig Tracy Gallery can be found in New Orleans. 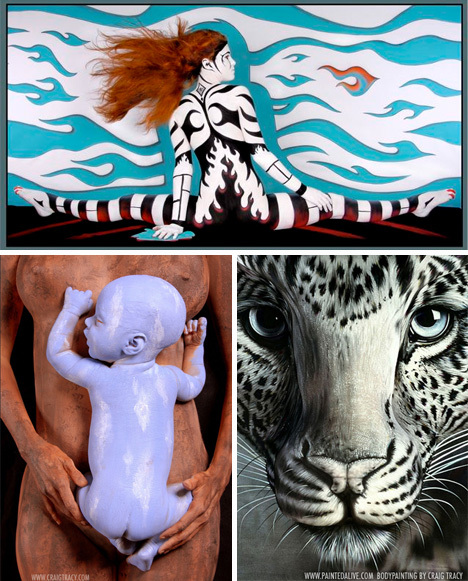 It’s the only gallery in the world dedicated to fine art images of body paintings, and it also features videos of the body painting process for those interested in seeing the paintings unfold.